You have 3147 characters. Don’t forget to add important and relevant keywords in your description to improve your iTunes app page and optimize your SEO. Your app's last version was released on August 05, 2010. It is important to regularly update your app. Best practices recommend to update your app every 4 to 6 weeks. This means fixing reported bugs, improving existing features, launching new features etc. Keep an eye on users' feedback. The next great features may already be asked by many users. 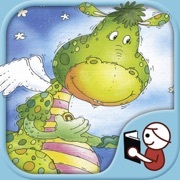 Danny The Dragon Meets Jimmy is a captivating, multi-award winning tale about a delightful, polite and lovable dragon named Danny, and his sidekick Skipper. In a most unusual way, they stumble upon the home of a boy named Jimmy. Danny’s mode of transportation - he shrinks and travels in a green sea shell! Reading the story, children are also transported - from our fast-paced multimedia world to a simpler place and time. This book was nominated Best Children's Picture Book of 2009 and has won numerous awards including: 2nd place winner for Children’s Literature in the Arizona Literary Contest and Book Awards of 2009, International Book Award winner in 2010 for the best Children's Picture Book: Softcover Fiction (w/Audio CD).